If you haven’t been to an Argentinian steakhouse, drop everything right now and find one. I’m not kidding, just do it. If you decide to go to Tango Sur, at 3763 N. Southport, you can’t go wrong. Although, you’ll be able to pick everything you dropped right back up because you’ll have at least an hour wait if you arrive anytime after of 6:00. Pictured is the Bife Vesuvio, a special for our visit on a busy March Saturday. My wife and I met another couple here for some beef and pleasant conversation. This entree was $21, but don’t let that $20 plus entree scare you off because it was a bargain of epic proportions. My wife ordered this and I had El Fillet. The portions were so massive that we could have shared one. We took half of each home (yes, El Fillet on toasted sourdough the next day was awesome). I took a picture of hers because it was more photogenic, although they were both worthy of consideration for the beef hall of fame. The value here is untouchable. The prices are unreasonably low for the portion size and each entree comes with bread, salad, and a starchy side. It’s BYOB and the corkage charge is negligible or zero, so you don’t blow big dollars on alcohol. And everything tastes great. That’s probably why it’s so busy all of the time. I’m talking really busy; you have to wait in line just to wait in line. I stood in line for ten minutes to find out that a table for four was a two hour wait. A young woman took my name at 6:27 and wrote down my mobile phone number. We ran and grabbed our friends and then went and had a few beers at Take Five (about four doors south). At about 8:20 they called and said the table was ready so we walked over and were seated at 8:30 on the nose. Easiest two hour wait ever in the history of America! Back to the food in the picture, I’m not exactly sure what cut of beef this was and I’m not sure what kind of cheese they stuffed it with (I think provolone). I do know that it was filled with spinach and some standard vesuvio spices like oregano and garlic. It was marinated in a bunch of spices and sauces and, of course, it came with a side of chimichurri. 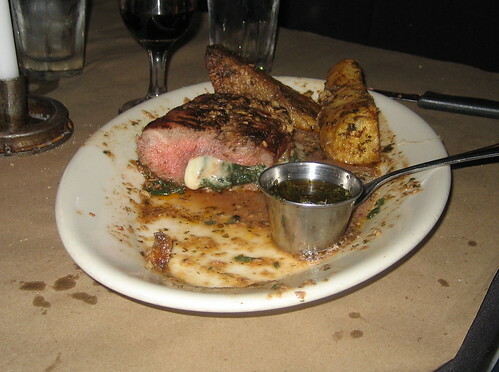 It was a relatively lean and tender piece of beef with explosive flavor. All the meat here definitely has some spice in it. I never trust those meat-eaters that say “I don’t like sauces and spices on my meat because a well-cooked piece of beef has enough flavor.” SHUT UP! A comment like that has food-snob written all over it. I challenge any carnivore to look Bife Vesuvio in the eye and say “hold the vesuvio spices because it covers up the natural flavor of the beef.” That’s idiotic! As Mike Greenberg would say, “It is what it is.” This is not an American steakhouse and it’s not a Brazilian steakhouse. It’s an Argentinian steakhouse, and it’s a glorious food experience. Posted in food on 2007/03/06 by John.